The S&P 500 (NYSEARCA:SPY) pushed to its highest point in weeks before reversing last week. The price action has been volatile across the major stock market indices with major news headlines still dominating the markets. See my forecast (and in-depth video) below for more details. The stock market rose last week, with the S&P 500 (SPX) up 52 points to 2656, an increase of 2%. The news cycle pushed the markets around, covering everything from an FBI raid on Trump’s personal lawyer to a chemical weapons attack on Syrian civilians. Our projection this week is for stocks to decline to the support zone of 2616 to 2620. On Monday, White House advisor Larry Kudlow insisted that the US is not engaged in a trade war with China. Later that the day, the FBI raided the premises of President Trump’s personal lawyer, Michael Cohen, confiscating key records. This was controversial because the records were believed to fall under the rules governing attorney-client privilege. On Tuesday, Chinese President Xi Jinping spoke at the Boao conference on the island of Hainan, China. Xi spoke about the policy reforms that would continue to open the Chinese economy to global trade. This generated confidence that the trade spat with the US would be resolved without too much drama. On Wednesday, Russia threatened to shoot down US missiles headed for Syria. To which Trump later assured via Twitter that, “they will be coming, nice and new and ‘smart’.” Later that day, the Federal Open Markets Committee released the minutes from its March meeting, which was interpreted as hawkish and indicated that members expected both growth and inflation to rise in the coming months. The events surrounding Syria pushed Crude Oil another 2.4% higher on Wednesday, after having risen 3.4% on the previous day. In fact, oil prices rose every day last week, ending the week 8.3% higher. 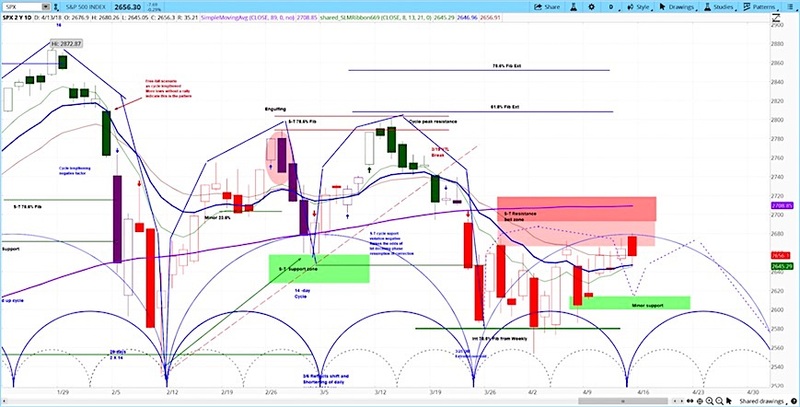 Our video, Crude Explodes, analyzes how market cycles may affect the coming price action. On Thursday, former FBI director James Comey released an excerpt from his forthcoming book “A Higher Loyalty” in which he describes Trump as “unethical and untethered to truth”. Trump later responded in kind by pointing out that Comey is a “weak and untruthful slimeball”. On Friday, the latest earnings season kicked into high gear with big banks such as JP Morgan, Citigroup, and Well Fargo. While banks in general beat analyst expectations, their shares nonetheless slumped for the day, perhaps with the market expecting even stronger results based on tax cuts and deregulation. With equities up last week, gold was up 0.9%, and oil was up 8.3%, the euro was up 0.5%, and bonds were up 1.4%. Our approach to technical analysis uses market cycles to project price action. Our projection for the S&P 500 (SPX) in the coming week is for pullback in the S&P 500 to the support zone of 2616 – 2620. The semicircles on the daily chart above represent the market cycles. For an introduction to cycle analysis, check out our Stock Market Cycles video, or watch the askSlim Market Week show every Friday on our YouTube channel. The latest episode is below.